Give the gift of Trails this Holiday! Get this eNewsletter as a PDF document! 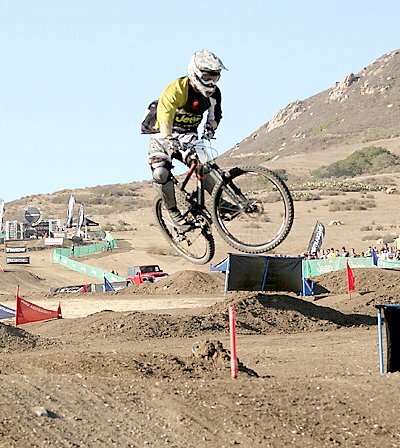 Eric Carter, past National and World BMX Champion, at the Jeep 48STRAIGHT Championships in San Louis Obispo in October. He wrote an open letter to LA City telling how BMX riding inspired him to improve his life. See the full letter. The draft Los Angeles City Bike Plan was recently released and mountain bicyclists should be concerned with the direction it has taken. Public comments can be submitted using our online petition. It will only take you only a moment to fill in the petition; we have provided everything you need. Comments from bicyclists are critical to getting legal off-road riding in LA City Parks, from LA City residents and non-residents alike. The comment period ends on January 8, 2010, so do it now! See the article in November's eTerraTimes for details. If you’ve already sent in your petition, thank you and please forward this to a friend! Also, see the story from Eric Carter, National and World BMX Champion, on how BMX riding was critical for his rising above the dangerous neighborhood where he grew up. This is a heavily used trail and is in need of some brush and tread work. We will drive up the Mount Lowe fire road to the end of the pavement. From that point one group will load a couple of BOB Trailers and attach them to their bikes and ride 3 miles up to the top of the trail near Inspiration Point. That group will work down from there. Another group will hike in via the Echo Mountain trail and then work up the Middle Merrill. CORBA will provide lunch from El Pollo Loco after we finish working on the trail around 2:00 pm. Details are on the CORBA calendar. Or you can view the flier. 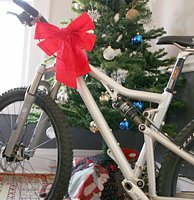 Give a CORBA membership as a holiday gift to the mountain biker in your family or among your riding buddies! Or give a gift of a donation to the trail project of your choice! 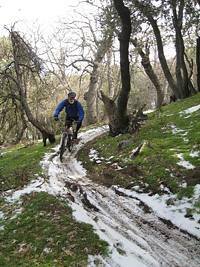 Make this a special MTB holiday - give the gift of trails! And remember, as a charitable organization, your contribution to CORBA can be used as an income tax deduction. On December 15th, Rancho Palos Verdes contracted Mountain Recreation & Conservation Agency Authority (MRCA) to patrol the Portuguese Bend Reserve. MRCA currently serves the Santa Monica Mountains Conservancy, the Conejo Recreation and Park District, and the Rancho Simi Recreation and Park District. Rangers will educate the public about the appropriate use of trails, open space and parks, and will have the authority to enforce municipal code violations such as park hours, reckless behavior on trails, dogs roaming off-leash, littering and fires. MRCA personnel are trained peace officers and can issue tickets. Of particular concern is the area that has been recently burned, which is off-limits to all users. If mountain bikers ride in the burnded area, we may lose our privilege of riding there. Please stay out of the burned area until it is re-opened to the public! Calling all mountain bikers age 18 and over! The Mountain Bike Patrol Unit (MBU) is currently recruiting for its 2010 New Recruit Training Class. 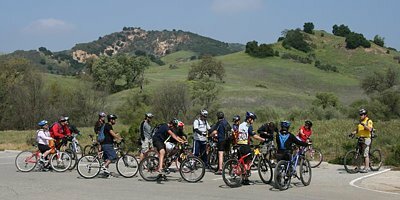 If you enjoy mountain biking and are interested in giving back to the community by volunteering some time to assist our understaffed Park Rangers in patrolling their parks, then the MBU may be just what you are looking for ... the MBU support and are sponsored by the National Park Service (NPS), the California State Park Service and the Mountains Recreation and Conservation Authority (MRCA). Here's what it's all about. The MBU assists in providing park visitors with a quality outdoor experience and preserving natural resources while patrolling over 60 thousand acres of public parkland in the Santa Monica Mountains National Recreation Area. Beginning in Feburary 2010, training will include visitor contact skills, State & National Park radio use, park rules & regulations, first aid & CPR and field training exercises. Patrol areas include the following National Park Service locations: Cheeseboro/Palo Comado, Zuma/Trancas Canyons, Rancho Sierra Vista and Circle X Ranch; State Park locations: Malibu Creek, Will Rogers, Point Mugu and Topanga. In addition, we patrol MRCA areas near metropolitan Los Angeles along with participating in various other events such as the LA and Malibu Marathons, Wheels to the Sea and the Ventura County Fair. The MBU also help support CORBA's Youth Adventure Program which offers disadvantaged youth the opportunity to enjoy the mountain biking experience in our beautiful parks. All of our Patrols require at least two patrollers which are self scheduled on our website. We ask each of our volunteers for 100 patrol hours annually (roughly two 4 hour patrols per month). Would you like to learn more? We invite you to come to King Gillette Ranch Auditorium at 9:00 am on Saturday, February 06, 2010 for an indoor orientation meeting where we will share with you more details about this wonderful program and what patrolling with the MBU is all about. We encourage you to bring your bike and helmet because we plan on going for a bit of a fun ride after the presentation (weather permitting). For more details, visit the MBU training web page. To see the MBU in action, view our gallery of MBU photos. As a youth growing up in the city of Lakewood, California, I was exposed to a number of negatives. My next-door neighbor was a drug dealer who also ran a halfway house for illegal immigrants. In my immediate neighborhood there was a drive-by shooting; a kid I grew up with got in trouble for running guns. These are just few of the things I was exposed to. I understood at an early age right from wrong, but sometimes got involved with the wrong kids; fortunately this happened before I was exposed to drugs. My criminal highlights were shoplifting candy and stealing valve stem covers from a car lot to sell at school. That was before I learned how to ride a bike. The world changed for me on my 8th birthday, it became a bigger place and I instantly had more freedom. My parents were smart enough to realize I had found a passion and leveraged it against me to do right. Getting good grades and staying out of trouble meant I could continue to ride my bike; mess up and the bike was taken away. Fast forward to today, I have traveled the world as part of my career as a cyclist, I have been to over 20 countries - Europe, Japan, Australia, New Zealand, Tahiti, Reunion Islands and South Africa, all due to the positive influence of bicycles in my life! I started making a living at 15 racing BMX cycles and when I graduated from high school I had over $100 grand in my bank account. I drive through my old neighborhood often and I always wonder what life would have been like for me had I not found bicycles. I firmly believe that I would be in jail or dead. This simple machine saved my life. We always had dirt lots and secret places to ride, but they were illegal and not very many kids were involved. But imagine if there had been a trail network! How many kids would have gotten involved? How many other kids could have been saved? I realize my life and the results are rare, but cycling is a positive activity and gives positive results mentally, physically and builds confidence for kids. I now am witnessing this first hand with my two children. Imagine encouragement instead of discouragement from parks and recreation - to come to the local park and ride a pump track or other type of course that is conducive to learning to ride a bike safely. There are all types of projects popping up nationwide that involve inner-city off-road cycling. Trail networks are being built from New York City to Seattle, all with positive results. For instance trails are being built under freeways in Seattle as a way to occupy space with positive activities instead of providing areas for homeless people or drug addicts to hang out. In addition to being a professional cyclist with over 20 National and 5 World Championships, I build bike parks for a company called Alpine Bike Parks, and as recently as six months ago worked on a project in a city park in Fontana, building a BMX track that is open to the public. Please, for the future of our children, consider development of cycling as part of the master plan for the city's Recreation and Parks. Jim Hasenauer, founding member of CORBA and IMBA, is interviewed on Bike Talk on KPFK 90.7 FM radio. Listen to Jim's interview from November 7, 2009. Tuesday night Dec. 29th at 11 pm, Bike Talk aired a new segment interviewing Steve Messer from CORBA and Jordann Turner from the LA City Planning Dept. on the LA Master Bike Plan. This segment is available for download as a podcast. CORBA has been invited to be a regular guest on future Bike Talk shows to discuss mountain bike issues. Save the Date! The 2010 CORBA Fat Tire Fest will be on October 17th! We will be returning to Castaic Lake for the 2010 Fat Tire Fest on Sunday October 17, 2010. Check the 2010 Fat Tire Fest web page for more information as it becomes available. CORBA has an online form to help mountain bikers petition for off-road bicycling in LA City parks - December 21. Fill out the form and send it in today because the comment period closes on Jan 8, 2010. Saturday January 2nd is the next skills clinic. CORBA holds a recreational bike ride for beginners the second Saturday of every month, a week after the Skills Clinic. This is the perfect opportunity for the clinic attendees to practice their new skills! But you don't need to attend the Skills Clinic before you come on this ride; everyone is welcome. This is a great ride for first-timers to the CORBA recreational rides. The ride leader will go over the basics of riding a mountain bike along the route. Check the Calendar for details.